Rayon seam binding can be a fairly versatile notion and one that you'll find really handy for adding finishing touches to garments. You can usually find seam binding at your local fabric store, but I will say, it's sadly one of those items that has now been taken over by the polyester revolution. The polyester stuff is pretty crummy - really really stiff and a little too thick. The rayon type is really quite nice. Its nice and thin but has quite a bit of strength and it's got body too. Plus it comes in some really lovely colors. OK, so what is rayon seam binding? It's a densely woven, lightweight, thin ribbon. You can bind seams with it, use it as a hem tape, as an embellishment and I've even used it as a light version for a waistline stay - in this dress actually. I use it mostly to hem garments. I love it as a hem tape! It's so nice and lightweight and doesn't leave any unsightly bulkiness. Here's how I apply it. 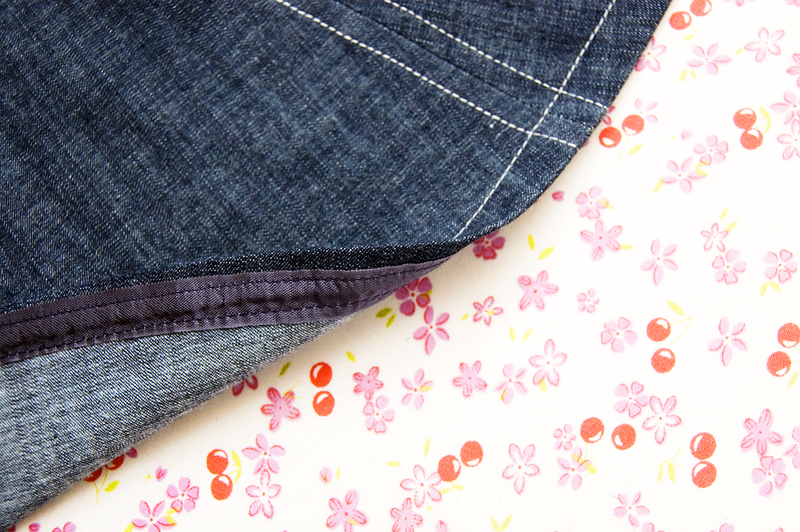 Stitch the seam binding to the edge of your hemline. I usually line up the garment's hemline in the middle of the seam binding and stitch close along one edge of the seam binding. 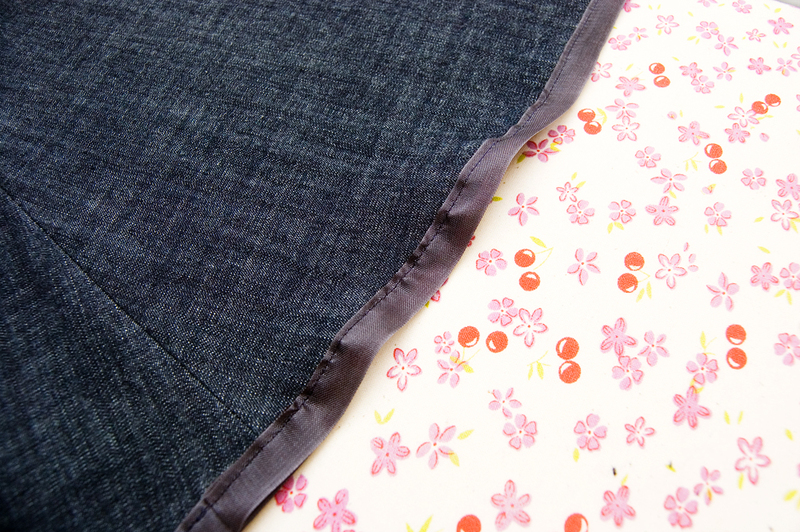 Press the freshly stitched seam binding flat and then press your hem into place. Here I used a really small hem allowance as I'm working with a half circle skirt, but you can always use a larger hem allowance depending on your preference. 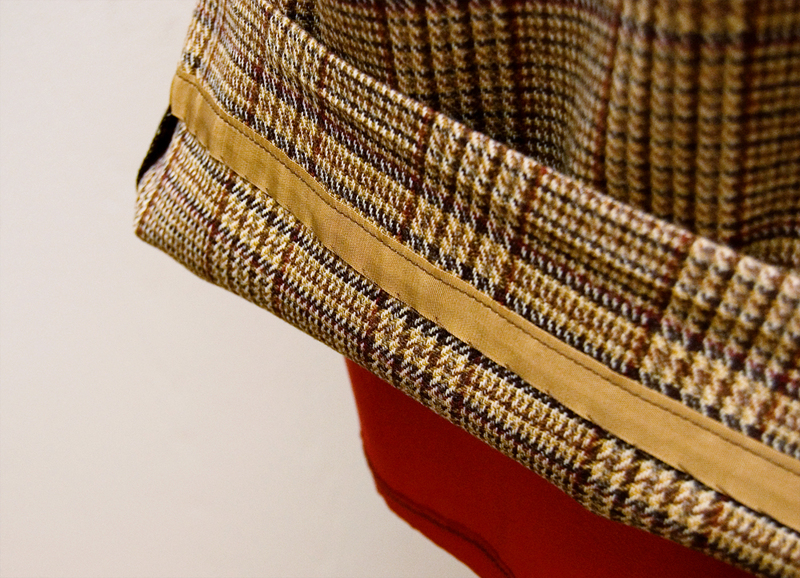 Handstitch or topstitch your hem in place along the unstitched edge of the seam binding. 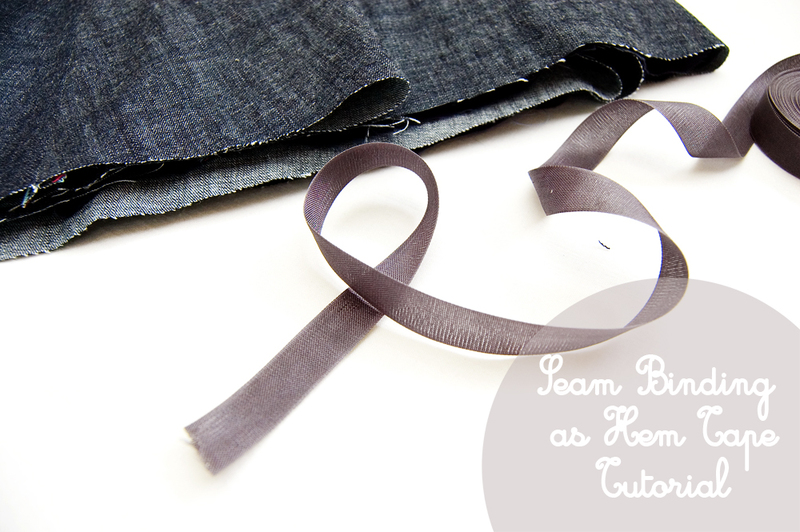 Give your hem a good press when your finished and Voila! You're done! Easy peasy. I applied it to both of my recent pencil skirt makes - here's my little plaid number. See? It provides such a nice finished touch. It's fun to use contrasting colors too! Go a little crazy! I think it makes the inside of the garment just as pretty as the outside and for me, that says a lot. What do you use seam binding for? Great tutorial! I will definitely be buying some of this!! I have never done this but I am interested. Rayon seam binding seems to be an easy process. Is it the same process for seam building for quilt? Seam binding is the bomb-diggidity....it is only way to go for hems!!! And your colors are so vintage and darling....swoon. swoon. Sunni - I'm going to include this info in one of my posts! I'm a huge proponent of hems stitched with seam binding and I've even used it to bind seams in a garment or two. Thanks for sharing this! Hi Sunni! Thank you for the info! I've seen it in some garments before but never thought about it. Now that I know what it is I can apply it to my own sewing. Thanks again! I'm a big seam binder fan! I don't own a serger (yet) so if I don't line a garment I'll most likely use binding (I hate zigzagging seams, it's does not look very pretty). 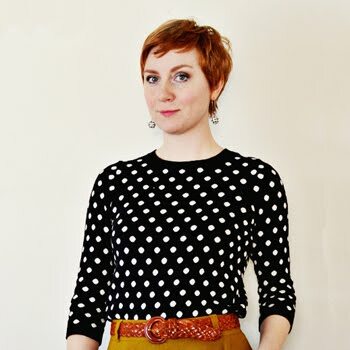 I also use it just like in your plaid skirt hem (i did i tin my last burda dress from the october issue). I usually use bias tape as seam binding but this looks so much nicer!! I think I need some! Thank you! I wondering the details on technique for using this. Now I can't wait to try it out. Maybe this is a silly question...but why do you do this? What are the advantages of sewing a hem this way rather than just folding twice and sewing up? Thanks for teaching this, Sunni! I have a ton of this stuff from my grandma's sewing supply stash, and have been wondering how to use it. So envious! I wish I had inherited a ton of this myself. I love seam binding! Such a nifty little notion! First and foremost - bulk. This de-bulkifies your hemline. 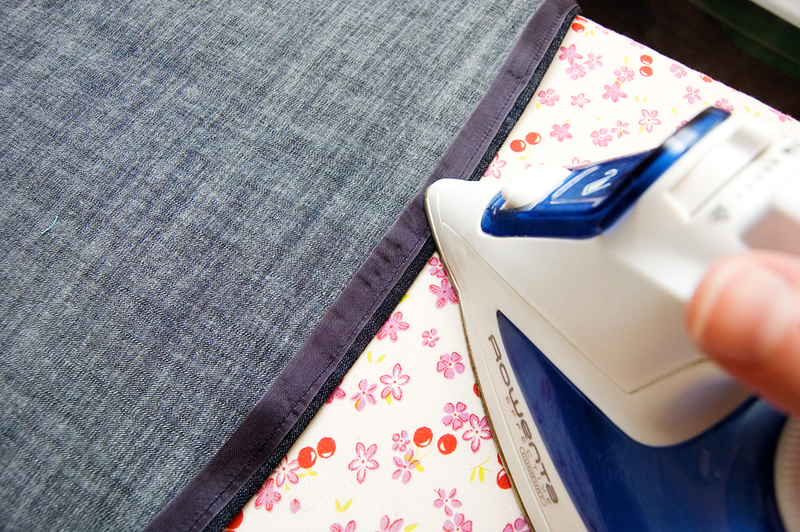 Especially if you're working with a really bulky fabric, this will cut down on that. Also, it's just pretty on the inside. I love seeing that little flash of hem tape. Looks so professional. I love it! I think bias tape is a great option too, but a little more finicky. This stuff is just easy peasy to use. Oh I'm so glad! The stay tape is rather magical isn't it? I swear its woven by fairies. Thank you Carolyn! I definitely need to try it as the traditional seam binding, in fact, I think I'll try it out on my next garment. I do so love it as hem tape though. Gosh, that I really couldn't tell you only because I've never actually sewn a quilt! I would imagine that you could use that ribbon binding that you find in stores though. It would require a different technique - more like a hong kong finish I would imagine. I use this stuff for all of my seams that aren't frenched, and it's amazing. And a pretty little contrasting pop of colour on the inside of a garment alway make me happy :). Must start using it for hems too! I love this stuff! I've got several rolls, but as I sew mostly historical garments, it's going to take me a long time to work my way through the rolls of Hug Snug. I actually used some dark teal rayon seam binding as the trim on one of my Regency gowns, since it was the perfect color, lightweight and smooth, and easy to work with. I got my order from you last week and I decided to start small and use some seam binding on a pair of pants for my 4yr old. They turned out great! 3 yds was exactly enough for all leg seams and hem binding. None was needed at the waist and for the front/back croch I used flat felled seams (I'd started the project before you posted about the seam binding). And in true 4-yr-old form, when I asked my son what he thought his response was "not cool" then he tried them on and exclaimed "I love them!"